Yesterday's torrid US market "melt-up", which was the strongest post-midterm rally since 1982 after an election whose outcome was supposedly "priced in", has faded with futures dipping 0.4% as traders shift their attention to today's FOMC decision. Even with the US taking a breather, world stocks enjoyed the eighth straight session of gains in their longest winning streak of the year on Thursday, as strong trade data from China kept the momentum from the previous day’s U.S. rally rolling. European shares initially jumped to a one-month high, though they have since pared most of their earlier gains despite solid results from Siemens, SocGen and Commerzbank and Sodexho which eased concerns about slowing corporate earnings in Europe. Asia and Wall Street had set similar milestones overnight. Japan’s Topix jumped 1.7% and shares in Hong Kong and South Korea also posted solid gains. Hong Kong's Hang Seng advanced 0.3 percent while the Shanghai Composite dipped 0.2 percent, unable to hold on to gains from stronger-than-expected October Chinese exports data. Australian stocks rose 0.5 percent too, South Korea's KOSPI added 0.7% and Japan's Nikkei surged 1.8 percent, which was almost as much as Wall Street's 2 percent leap. Earlier in the day, China reported that exports growth picked up modestly to 15.6% yoy in October, and imports growth also accelerated to 21.4% yoy in October. Both readings are above consensus. However, in sequential terms, exports slowed to 1.2% mom sa non-annualized, from a strong gain of 3.4% in September. The dollar rebounded from two and a half week lows after three days of declines, while Italian bond yields jumped after the European Union warned the nation’s budget deficit will move dangerously close to the economic bloc’s limit of 3%. Donald Trump’s loss of the House of Representatives in the midterms reduced the chance of another tax cut. That in turn had analysts and money managers breathing a sigh of relief that the U.S. economy wouldn’t ultimately overheat and force the Fed to keep jacking up borrowing costs. “We think we are close to the end of the appreciation of the dollar,” said fund manager Amundi’s Didier Borowski, who expects the Fed to pause its hiking cycle next year as the economy starts to slow. “Usually we see a year-end rally (in stocks)” he added. The bond market there was plenty of activity too, with the 10-year Treasury note yield rising to 3.24%, its highest since Oct. 9, before dipping a couple of basis points lower. Italian government bond yields were up to five basis points higher in early trade following key economic projections from the European Commission which warned the country’s 2019 deficit will be much higher than suggested by Rome. It pushed Italy’s bond spread over higher-rated Germany out to 290 basis points and Mizuho rates strategist Peter Chatwell warned of a possible further sell-off if Rome’s populist coalition government thumbs its nose at Brussels again. “In our model, it doesn’t move fair value much from 300 bps (over Germany) but scary headlines are likely to cause a widening,” he added. While the resignation of Attorney General Jeff Sessions prompted much media attention on Wednesday, it had no impact on markets, where the attention now shifts to Thursday’s Federal Reserve decision. Investors will be looking for any signals on the pace of policy tightening into 2019. In currencies, the Bloomberg Dollar Spot Index whipsawed amid thin volumes ahead of the Fed rate decision. The euro swung between gains and losses as it traded in a narrow range; Sweden’s krona rallied to a three-month high against the euro after the Riksbank reasserted its tightening plans in a parliament hearing, while also benefiting from a continued strong demand for global equities. Norway’s krone and Canadian dollar were also supported by equities and by stabilizing oil prices. The Aussie got a boost from stronger-than-forecast Chinese trade data; the kiwi reversed gains as the greenback gained traction after the London open; it earlier rose as the central bank held rates and removed an explicit reference to a rate cut in its policy statement. The yen weakened as a rally in Japanese stocks damped haven demand. In commodities, WTI inched up 0.6 percent to $62.03 a barrel after falling to an eight-month low of $61.20 on Wednesday. Oil prices struggled after surging U.S. crude output hit another record and domestic inventories rose more than expected. Major European indices are mixed (Eurostoxx 50 -0.2%) after beginning the session in the green, the SMI (+0.4%) is leading the gains, while Italy’s FTSE MIB (-0.5%) lags its peers. Similarly, after starting the session in the green major sectors are now somewhat mixed. underperformance is being seen in the consumer discretionary sector while financial names are outperforming as the sector is buoyed by SocGen (+2.8%) and Commerzbank (+6.0%) post-earnings. In terms of individual movers, Prosiebensat (-16.0%) are at the bottom of the Stoxx 600 after a miss on their earnings, while UniCredit (-2.0%) are also lower following pessimistic earnings due to write-downs for Turkey not being factored into estimates. Asian stocks were mostly higher as they took impetus from the post-election rally seen on Wall St where all majors gained at least 2% and the DJIA notched more than a 500-point gain as investors ploughed back into stocks after the US mid-terms results conformed to the broad consensus. 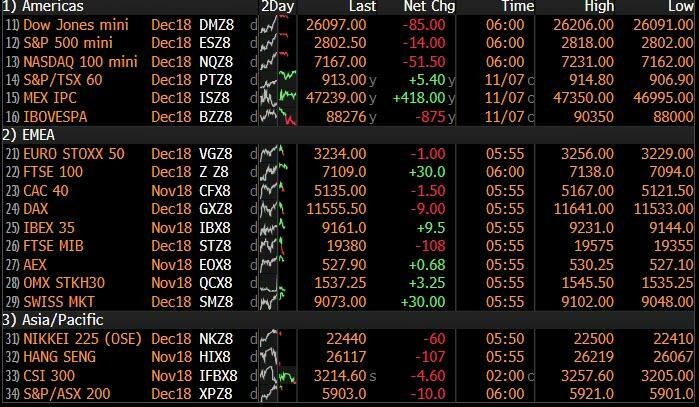 ASX 200 (+0.5%) and Nikkei 225 (+1.9%) were both firmer from the get-go with tech the outperformer in Australia after a similar strong showing of the sector in US, while the Japanese benchmark ignored the largest drop on record for Machine Orders and was boosted by a weaker currency. Shanghai Comp. (-0.1%) and Hang Seng (+0.9%) initially benefitted from the heightened global risk appetite with the latter underpinned by a decline in money market rates after the PBoC’s bill sale in Hong Kong the prior day, while participants also digested the latest trade data from China in which Trade Balance slightly missed but Exports and Imports both topped estimates. Finally, 10yr JGBs initially tracked the downside in USTs as the rampant tone in equities weighed on safe-havens but with losses stemmed following firmer demand at today’s enhanced liquidity auction for 2yr-20yr JGBs. In currencies, the DXY index is holding relatively firm above the 96.000 handle within a fairly confined range awaiting the Fed and confirmation that it remains on course to deliver a 4th and final 25 bp hike in December. However, the Dollar is not ahead across the board vs G10 counterparts as it continues to struggle in wake of the mid-term/midweek wobble, and certain currency rivals glean support from independent factors. SEK/NOK/AUD/CAD - All outperforming, albeit to varying degrees and not necessarily for obvious or intuitive reasons. The Scandi crowns have hawkish Central Bank vibes and mainly strong economic/fiscal fundamentals, as Eur/Sek tests 10.2600 bids/support having breached a key tech level above 10.3000 and Eur/Nok revisits 9.5000 with added fuel from a rebound in oil prices, albeit from fairly deep lows. Meanwhile, the drew some encouragement from upbeat Chinese imports and exports overnight to edge a fraction closer to 0.7300 and the Loonie heads into Canadian housing data back above 1.3100, also with the aid of recovering crude. GBP/CHF/EUR - Yet more conflicting Brexit reports for the Pound to contend with and keeping Cable choppy within 1.3090-1.3150 parameters, but Eur/Gbp softer around 0.8700 in wake of news that UK PM May is heading back to Brussels for more talks and suggestions via the Austrian press citing EC sources that a deal could be reached as early as Monday. The Franc is back below parity and single currency also whippy amidst latest EU-Italian divergence on Rome’s 2019 budget projections and assumptions about deficit developments – Eur/Usd between 1.1410-45, and also eyeing decent option expiry related interest from 1.1415-25 (1.3 BN). In commodities, WTI (+0.5%) and Brent (+0.6%) are both higher following yesterday’s sell-off as China’s October crude imports reached a record high of 9.61mln BPD, a 32% Y/Y increase, hence watering down concerns that a slowdown in their economy may lead to a glut in the oil market. Upside in oil prices are capped amid yesterday’s EIA data which showed a record production of 11.6mln barrels of US crude. Gold (-0.2%) prices have eased as the dollar rebounded from post-midterms lows ahead of the FOMC meeting later today. Elsewhere, Chinese aluminium exports fell 3.6% from September’s level, as sliding domestic production meant there was less available metal for overseas markets. Furthermore, copper underperforms today after China’s imports of the red metal falling by 18.7%, signalling lower demand. Looking at the day ahead, highlight is the Fed meeting. Prior to that the data releases this morning include September trade balance readings in Germany and France and also the European Commission’s latest economic forecasts update. In the US we’re only due to get the latest weekly initial jobless claims print. Also worth flagging today are scheduled comments from ECB President Draghi in Dublin at 3.20pm GMT. On the year-end rally, markets perfectly adhered to the usual post-midterms playbook yesterday as equities soared on Election Day +1. The NASDAQ (+2.64%) led the way with the NYSE FANG index also soaring +2.92% (Amazon +6.87%), closely followed by the S&P 500 (+2.12%) and DOW (+2.13%). The S&P 500 also went above its 200-day moving average for the first time since October 19th and has now retraced over 50% of the -9.88% decline the index took from the end of September into October 29th – the recent lows for the index. It’s also seen four >+1% moves in the last seven sessions. Volatility has certainly also fallen in recent weeks with the VIX yesterday falling -3.55pts (the biggest % fall since February) to 16.36 and its lowest since October 9th. That intraday high of 28.84 back on October 11th feels a while back now. After a wide-ranging press conference where he dangled the prospect of bipartisan deals, President Trump accepted the resignation of Attorney General Jeff Sessions. His chief of staff Matthew Whitaker, who has called the Mueller investigation a “witch hunt,” will now take over oversight of the probe. This is a potential source of volatility moving forward, but vol and equity markets ignored the news amid yesterday’s euphoric rally. Elsewhere, Europe also had a decent day yesterday too with the STOXX 600 rising +1.06% and European Banks +1.52% with Spanish lenders leading the way following a reversal of the mortgage tax verdict where banks were at risk of billions of euros of costs. Spanish banks were off the early highs of +5.81% to close +2.43%, as the Spanish PM suggested he regretted the reversal and would publish a decree to make the banks pay the tax going forward. Separately, the ECB nominated Andrea Enria (from Italy) to succeed Daniele Nouy as head of the central bank’s supervisory operations. The pick should clear the way for Bank of Ireland Governor Philip Lane to be appointed as successor to Peter Praet on the ECB’s Executive Board as Chief Economist. Lane is a pragmatist, so there should not be a major change to policy, though at the margin he may favour more macroprudential policies to limit financial excesses rather than interest rates, making him slightly more dovish on rates than otherwise. Less one-way traffic was the move for oil yesterday. Following headlines out of Bloomberg suggesting that OPEC and allies were discussing production cuts for next year, Brent and WTI jumped as much as +2.40% and +2.45% from the early day lows before bearish supply data saw the oil complex give up all of those gains before closing -0.08% and -0.87% Brent and WTI respectively. On the potential cuts, remember that it was only back in June that we had the agreement among OPEC and major producers to boost output. Bloomberg quoted delegates as saying that the OPEC and allies coalition are likely to discuss the possibility of a cut this Sunday in Abu Dhabi. As for other markets yesterday, well the other side of the midterm result was a weaker greenback (USD index -0.33%), and a flatter US curve. Ten-year yields closed +0.8bps higher after testing those seven-year highs just over 24 hours ago while 30-year yields fell -0.6bps. Two-year yields on the other hand were +2.9bps higher meaning the 2s10s curve flattened 2.1bps and the most in a month. The midterm results also helped the MSCI EM index to rise +0.57% while in FX the South African rand paced gains (+1.48%), however the Mexican peso fell -0.73%, possibly due to renewed concerns that the incoming Democratic House majority could delay or defeat the new USMCA deal, which has been negotiated to replace NAFTA. Markets overnight have taken their cue from Wall Street with broad based gains across much of Asia. Leading the way is Japan where the Nikkei and Topix are +1.92% and +1.81% respectively, while the Kospi (+1.64%), Hang Seng (+0.96%) and Shanghai Comp (+0.61%) are also higher. The most notable overnight release has come in China where the October trade stats are out. 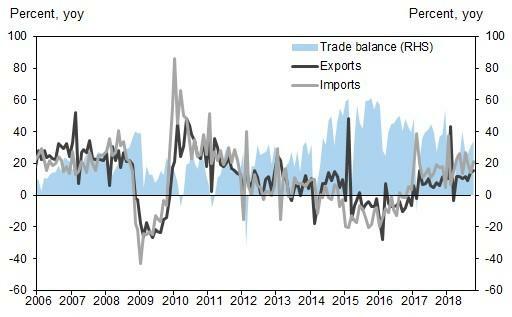 Exports in both USD (+15.6% yoy vs. +11.7% expected) and CNY terms (+20.1% yoy vs. +14.2% expected) have risen faster than expected, resulting in a small widening of the trade surplus. One suggestion might be a front loading of shipments ahead of the implementation of higher tariffs in January. So, with another political hurdle successfully dealt with its back to the more routine for markets with a Fed meeting to look forward to this evening. As a reminder this meeting doesn’t include a post-meeting press conference and is therefore unlikely to be a hugely exciting affair. Indeed the overriding consensus, both amongst economists and also in markets, is for no hike. Our economists believe that the only “drama” about the statement will be around alterations to the Committee’s description of recent economic developments. They note that the statement can continue to see the pace of economic growth and job gains as strong, and can acknowledge that the unemployment rate has declined further. Household spending has continued to grow strongly as noted previously, but business investment has softened in recent months. The statement may make note of this, perhaps by using a phrase along the lines of: "Recent data suggest that growth of business fixed investment moderated from its strong first half pace." Inflation will still be seen as remaining near 2%, with inflation expectations little changed on average despite recent declines in market-based measures. An acknowledgement of recent tightening in financial conditions is unlikely. Outside of the statement, there will be some focus on whether or not the Fed make another “technical adjustment” by reducing the IOER by 5bps, to ensure that the fed funds rate continues to trade within its target range. Our team think this will be deferred until December when they can again raise the IOER by 20bps, though the exact timing is not especially significant in terms of monetary policy. As such we’d expect a strong signal in today’s minutes. Staying with politics and the daily Brexit update, there was a lot more noise yesterday but still little substance on the key question: the Northern Ireland border. According to Bloomberg, Prime Minister May has shared the draft text of the UK’s withdrawal package, though has not included the section of the deal covering the Irish border. Officials from the EU, including Commission President Tusk and Irish PM Varadkar signalled that a deal may near, but the details are still being negotiated and are accordingly unclear. Despite the lack of true news, the pound continued its recent grind higher, gaining +0.21% to $1.313 (which is where its hovering around this morning), and our strategists expect a full deal to be announced next week, at which point the UK political reaction will be key. To the day ahead now, where the highlight is almost certain to be the aforementioned Fed meeting this evening. Prior to that the data releases this morning include September trade balance readings in Germany and France and also the European Commission’s latest economic forecasts update. In the US we’re only due to get the latest weekly initial jobless claims print. Also worth flagging today are scheduled comments from ECB President Draghi in Dublin at 3.20pm GMT.